Over its first fifty years the São Paulo Symphony has never yet been regarded as one of the great orchestras of the world, despite the claims of its own publicity - though it does occupy a high rung in South America, where it also undertakes a good deal of worthy outreach work. Its numerous recordings on the BIS label have brought it some degree of recognition, albeit among mixed reviews. Its reputation will certainly grow further under the tutelage of Marin Alsop, recently commenced, and an appearance at the 2012 BBC Proms certainly boosted its visibility, although that performance did clarify the amount of work still to be done. 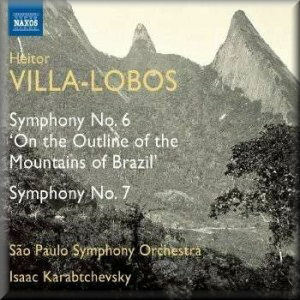 Isaac Karabtchevsky, despite his Slavic-looking surname, was born in Brazil, and a long and decent, if rather low-key, career to date sets him fair to gel with the SPSO and get this first Naxos volume of Villa-Lobos's eleven symphonies off to a good start. Its competition is not invincible: a 7-disc boxed set in CPO, consisting of recordings by the Radio Sinfonieorchester Stuttgart under American conductor Carl St Clair (777 516-2, 2009). Naxos have sagely chosen to open with the composer's first two mature symphonies - numbers one to four are fairly early, some claim relatively immature, works and the Fifth has been lost (explaining why his last is numbered 12 rather than 11). After five in five years, Villa-Lobos waited 25 more before composing his Sixth and Seventh. They are both fleshy, big-boned works, the Seventh for its sheer length and huge orchestra, and the Sixth for its subject matter - Brazil's mountains. Naxos give it the rather unwieldy title 'On the Outline of the Mountains of Brazil', though according to other sources Villa-Lobos himself called it simply 'Mountains of Brazil' ('Montanhas do Brasil'). For what it’s worth, he also subtitled the Seventh 'Odyssey of Peace' ('Odyssé da Paz') - Naxos curiously omit that from the track-list. Either way, both symphonies are grandly romantic and atmospheric, bursting with drama, local colour and international appeal. In a discussion of his works in New Grove, Villa-Lobos's symphonies are barely mentioned, yet there is nothing in these two to account for such an omission. Rather fancifully, Naxos's resident reviewer describes the sound quality of this recording as "quite superb". In fact, it is rather on the thin side - certainly in the strings - and audio is far from vivid anywhere, despite the impressive setting of the Sala São Paulo. Sound engineer Ulrich Scheider has immense experience at this level, with recordings going back twenty years, but somewhere along the way a few shortcuts have left a sound that a good pair of ears will rate no higher than comfortably acceptable. It may well be worth tolerating a few such rough edges for Villa-Lobos's riveting music. On the other hand, collectors who already possess CPO's set will not feel compelled to duplicate any part of it just yet, unless they would like, for sentimental reasons, a recording by a home-grown outfit. Good notes by Brazilian guitarist and Villa-Lobos biographer Fábio Zanon even explain the composer's curious employment of a surprisingly avant-garde process he called 'millimeterisation' to come up with melodies for Symphony no.6. A footnote mentions that this cycle project uses "revised scores", but leaves it at that. The follow-up volume, featuring the Third and Fourth Symphonies by the same performers, is due for release in spring 2013 - will the necessary engineering tweaks have been made?